May 15 was the deadline for CUNY colleges to notify adjuncts eligible for both three-year and one-year appointments. If there was a discrepancy in your letter of appointment or you received a notice of non-reappointment, it is critical that you contact a PSC adjunct grievance counselor by Thursday, June 22 so Contract Enforcement has time to file a grievance on your behalf before the 30-business-day deadline for filing grievances passes on June 27. Adjuncts are entitled to a one-year appointment if they have served in the same department of the college for not fewer than six (6) consecutive semesters (exclusive of summer sessions) during the three (3) year period immediately preceding the appointment. Adjuncts are eligible to be considered for a three-year appointment if they have taught at least six (6) classroom contact hours per semester within the same department at the same college for the ten (10) most recent consecutive Fall and Spring semesters preceding September 1, 2017. You receive a letter of non-reappointment. Key legislators in Albany are making an end-of-session push to enact enhanced Maintenance of Effort (MOE) legislation for CUNY and SUNY. It’s a bill that would dramatically increase both the investment in and quality of a CUNY education. The enhanced MOE would provide CUNY with an additional $157 million for academics and student support services. Don’t miss this chance to help make it a reality for next year. Please send this e-fax message of support to your representatives in Albany right now—then share it widely with friends and coworkers. If you’re on a smartphone, click here to call your representatives. I am writing to make sure you are aware of a new opportunity, available through the union, to enroll in a Catastrophe Major Medical Plan with no restrictions based on preexisting medical conditions. The 45-day enrollment period ends on June 15. This may be a one-time opportunity. I urge you to consider seriously whether this additional insurance to cover medical emergencies, available through our statewide affiliate NYSUT, is right for you. Fourteen PSC chapters held elections in the spring of 2017. The chapters elected their local officers, delegates and alternates to the PSC Delegate Assembly, and representatives to the PSC-CUNY Welfare Fund Advisory Council. Most races were uncontested, though there were contested races at the Graduate Center and Hunter College. The election results were certified by the Elections Committee on May 8. The term of office for the newly elected candidates begins on May 22. Click here for a list of all newly elected chapter leaders and here for the vote counts of the contested elections. 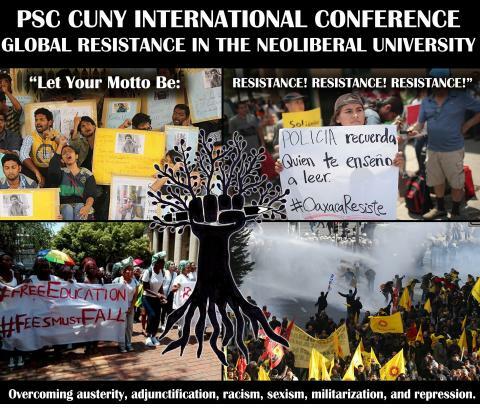 On May Day, hundreds of PSC members joined a nationwide university moratorium in resistance to assaults on knowledge and research by integrating into their classes an examination of the impact of President Trump's policies as relevant to the subjects of their classes. The NY Post published an article about the action with false headline: “CUNY professors will skip school to protest Trump.” President Bowen demanded a retraction in this letter to the editor and noted that the PSC explicitly called on professors not to skip class on May 1. The New York Post should publish a retraction of its headline, “CUNY professors will skip school to protest Trump” (April 30, 2017). The statement is a lie. It is contradicted by the Post’s own article. The leadership of the faculty union at CUNY, the Professional Staff Congress, explicitly called on professors not to skip class on May 1. Instead, we urged faculty to support the moratorium by including discussion of the impact of President Trump’s policies as they are relevant to the subject of their classes. In doing so, we adhered to the national standard on academic freedom, to which CUNY explicitly subscribes. Adjunct instructor Joe Borelli should look at his own union contract before calling for his fellow adjuncts to be fired. The contract’s opening page pledges a shared commitment to “full freedom of inquiry” and academic freedom. I stand by my statement that college faculty have a responsibility to challenge “alternative facts” and to equip our students to do the same. Fulfilling that responsibility is a pretty good definition of what college education means. In New York City and cities across the country people of conscience will take the streets on May 1st, May Day, and send a clear signal to the Trump Administration at the end of its first 100 days: We will stand together and resist together. PSC members will join with New Yorkers from across the city for a rally at 5 PM in Foley Square. PSC members will meet at the southeast corner of Broadway and Worth St. at 4:30 PM. Join us as we hear from people impacted by Trump’s bigoted and anti-worker policies. Join us as we celebrate workers and recommit to our shared struggle for workers’ rights and immigrants’ rights. Come recharge for the fight ahead with fellowship, solidarity and live music. Hashtags for the day are #MayDay2017, #HereToStay and #OurNY. PSC members will testify at the CUNY Board of Trustees Hearing on Wednesday, April 19, at 5:00 p.m. The hearing, which will take place at the Borough Hall in Queens, is an opportunity to support the PSC campaigns to raise adjunct salaries to $7,000 per course and reduce the faculty teaching load. Reply here by Monday, April 17, to let us know you plan to testify, and we will make sure you are signed up and have directions to get there. The PSC has taken the lead in fighting for the funds CUNY needs to provide a meaningful education for our students. A manageable teaching load is part of that need. Fair salaries and support for adjuncts, who now teach more than half of CUNY courses, are also a critical part of the need. Do your part by speaking as part of the union campaign on Wednesday, April 19. Let us know you plan to testify in person or would like to submit written testimony. Fourteen PSC chapters will be electing officers this spring, along with delegates and alternates to the PSC Delegate Assembly and members of the PSC-CUNY Welfare Fund Advisory Council. Ballots will be mailed to members’ home addresses on April 3, 2017. Ballots in uncontested elections must be received at the PSC office by 5:00 pm on April 27, 2017. Ballots in contested elections must be received at the office of the American Arbitration Association by 5:00 pm on April 27, 2017. They will be counted at 10:00 AM on April 28, 2017. Click here for PSC election rules and more details.